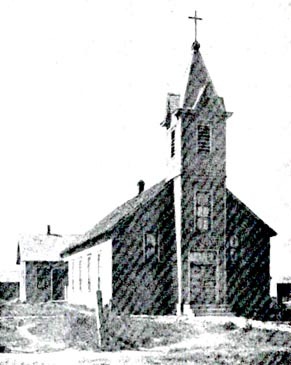 In October 1904, 30 members of the St. Francis Church in Munjor met to discuss establishing a parish and new village closer to their farms southwest of Hays. The new village was located on a site atop a scenic hill nine miles southwest of Hays. They wanted to name it St. Anthony, but because there was already a town named Anthony in Harper County, records show that "Saint Antonino" was the name applied for in 1905. However, because of postal regulations at that time, the post office took "Saint" off the name. Unlike the earlier settlements which experienced considerable difficulty in locating supplies, the Antonino founders received the gift of a frame building. A decade earlier, the "Gold Mill" hotel had been constructed to serve the boom town of Chetolah, following the discovery of gold on the Smoky Hill River. The Ellis County gold rush evaporated quickly and Chetolah became a ghost town in 1894. Using lumber from the defunct gold mine, Antonino residents donated most of the labor. The original church was built at a cost of about $3,000 and measured 80 by 30 feet. Fr. Maurus Schebler, Antonino's first priest, offered the first Mass March 25, 1905. Bishop John Cunningham dedicated the new Parish, Our Lady Help of Christians, in October 1905. Overcrowding was the main reason for the construction of a new church in 1951. Under the guidance of Fr. Flavian Meis, the parish built a much larger church, using many of the materials from the original church. A Gothic-in style building with an attached five-room rectory, full basement, indoor restrooms, electrical wiring and kitchen facilities was constructed. A buff color exterior nicely complemented the area's generous use of stone for buildings and fence posts. Many local parishioners donated labor and most of the cost of materials came from private donations. The new church was dedicated May 26, 1952, by Bishop Frank Thill. The community of Antonino celebrated its 100 year centennial in 2005.